A few years ago I saw an episode of $9.99 Deals with Dave Evans, a NYC Media produced half hour program highlighting interesting and affordable things do to in the NYC area. The episode highlighted a crochet workshop in Long Island City that offered amigurumi sessions for crafters of all experience levels. Being a knitter and crocheter the story caught my interest. Fast forward to April 2018, Stony Brook University Charles B. Wang Center offered a workshop that I had to sign up for – Small Potatoes: Creating Crochet Amigurumi. I took the day off and participated in the two hour program which was lead by Thien August, a crochet artist and owner of Tiny Island Handmade (look for her Etsy shop). She shared her expertise in selecting the correct yarn weight and crochet hook size. 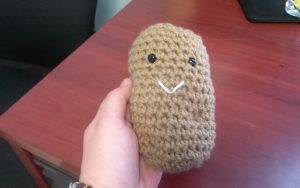 During the class each participant created their own amigurumi potato. Below is a picture of my finished potato – which I named “Big Fry”. Thien graciously granted the Stony Brook Stitchers permission to share her pattern for this craft. It utilizes simple single crochet stitches and incorporates easily accessible items like plastic eyes and polyester stuffing. Let your imagination go and create your own amigurumi. Once you start you will love creating these special items for our many patients at Stony Brook University Hospital + Cancer Center. Let’s put smiles on the faces of folks who might need a lift. This entry was posted in News, Patterns. Bookmark the permalink.